We are having a Doll's Tea on Thursday evening, the 25th of August. In addition to a complete evening tea, for this special event, you are encouraged to bring your favorite childhood doll for show-and-tell after the tea. Treva Smith, president of Penn-Ferry Doll Club will feature some of her private doll collection and share their stories. This promises to be a delightful and entertaining evening, a time for reminiscing and sharing. By advance reservation, please. Contact Susanna at Rosemary House. The dolly featured in the photo above is Nancy's Ginny doll. Our parents bought us each one of these 1950's era dolls. At one point in her childhood, much to the dismay of dear old mom, artist sister Marj, with nail polish in hand, painted chicken pox all over her dolly. All of the Ginny Dolls have since gone to the dolly hospital to have the chicken pox removed, hairdos redone, and fitted for new outfits as the original clothing is long gone. She holds a place of honor in the oak side-by-side cabinet in the tea room entryway. We love to make these super easy refrigerator pickles. There is no canning necessary. You just chop the veggies and add the seasoning mix and brine. Let marinate in the fridge for 24 hours and it is ready to go. Couldn't be easier! It's the perfect solution for what to bring to that next outdoor picnic! Add the package of spices and seasonings to a brine mixture of vinegar and water. The bread and butter pickles also have sugar added. The dill pickles are very virtuous with no sugar added. The Hot Pickles are "zippy" and do require some sugar. We like to make these pickles with a variety of veggies: cucumbers, of course, zucchini, onion, carrot even cauliflower. It makes a very colorful salad, in our area we call it "chow chow", that keeps well at picnics. Once made the veggies will store in the fridge for 6 to 8 weeks but they are so yummy, they never last that long!! The seasoning packets (recipe included) are available at The Rosemary House in the shop or online! In England, the celebration for National Cream Tea Day is set for Friday June 24, 2016! A Cream Tea differs from Afternoon Tea in that it simply features scones, a luxurious amount of clotted cream, preserves, and of course tea. The scone acts merely as the carrier for the fresh decadent clotted cream and preserves. Established last year, in coordination with Cream Tea partners Rodda's cream and Tiptree fruit growers and preserves, and promoted as a charity event across the country, their catch phrase is sharing the love of cream teas together. So let's jump in there and share the love! Who doesn't love a good Cream Tea! Visit the Facebook page of the Cream Tea Society today! If you have a sunny section of your patio consider planting a mixed pot of herbs. They require sun, nice soil and good drainage. We purchase pots with lots of drainage holes and then place coffee filters over the holes so the soil doesn't wash out and make a mess on the patio. When choosing your plants select a variety of leaf sizes and shapes to add interest. A creeping plant like golden marjoram or creeping thyme or prostrate rosemary which will grow and hang off the side of the planter is always fun. You can plant four or five herbs in the planter and they will all do well together. They will need watered daily when it is hot out and the other important tip is to remember to clip and use your herbs. They loved to be pinched back. It makes them bushier and healthier. These photos are from our recent planter class where attendees were able to select the style planter they preferred and the variety of herb plants they thought would be useful. Everyone left the class with a planter that was ready to be tucked into a sunny spot on their patio, and enjoyed and harvested throughout the summer season. One final peek into our Author's signing held this past weekend can be found on Annamaria Alfieri's blog, Murder is Everywhere, where she shares her experience in Mechanicsburg, PA. It's fun to read about the adventure through the words of the author. These African Ibeji were part of our decor for the event. They were gifted to our parents well over 50 years ago by friends that traveled to Africa. They represent a twin that passed away in infancy. These wooden dolls were created to honor the deceased twin. They were placed in a special location in the home, dressed, and symbolically fed in remembrance of the deceased twin. Additional information may be found here. Our themed tea last Sunday was with an African twist as we celebrated the historical mystery novels set in British East Africa penned by Annamaria Alfieri. A book signing and author meet and greet was held in the gardens where guests could gather before tea. Once they enjoyed a few nibbles outside, attendees were invited inside by our young safari guide, Cedar who took tea requests. Although a pot of Rooibos would certainly have been the perfect selection for this event, everyone was able to choose their tea of choice. Rooibos is a herb that is harvested from the Red Bush plant in South Africa. It has become readily available once trade with South Africa was opened. It mimics the properties of tea without the caffeine. It brews quickly, yields a reddish orange color in the cup and the health benefits include naturally enriched nutrients such as iron, potassium, calcium, and fluoride. Personally, I believe it is an acquired taste. The first course for our African themed event featured Saladu Nebbe, or African Black Eyed Pea Salad. This refreshing bean salad is quick to pull together, has a fresh dressing of olive oil and lime juice with a healthy amount of parsley. The recipe was found on a website called Cookie and Kate. So, translated, the African Kale and Yam Soup is a Happy Herbivore recipe. The Curry & Orange Marmalade round represented the blazing sun, while the Kenyan Tribesman's spear was a warm and toasted asparagus sandwich. The Tribesman's spear was the murder weapon in Strange Gods. The strange eye sandwich was cucumber, radish, and a garlic cheese spread. The African Jollof, another Happy Herbivore recipe is a tomato based veggie and rice dish well seasoned with a mixture of spices. It was served in the pastry shell to hold it all together. Vera McIntosh, the main character in Strange Gods is Scottish so we served Traditional Scottish Scones and Spotted Leopard Lavender Sage Scones with Sweet Cream and Strawberry Blackberry Preserves. Keep a Watchful Eye out for Zebras. Do you see it? And the trio of desserts featured: Do you see the Cheetah? Brownies, Mbatata (sweet potato) Cookies of Malawi, the "warm heart of Africa", and Don't Feed the Monkeys Banana Cream Tarts. Special thanks to Annamaria Alfieri for her entertaining presentation after the tea. And thanks also to David for sharing his collection of carved wooden animals that were used as centerpieces to help set the scene for our African adventure! Last Sunday we welcomed author Annamaria Alfieri to the gardens of the Rosemary House for a book signing followed by an afternoon tea. Author of Strange Gods, a British East African murder mystery, Alfieri captures the exotic feel of this foreign country, ties in a romantic component and follows the traditional who-dunnit syle in this popular novel. In addition to her African series, she has two other historical mysteries set in South America, Blood Tango and City of Silver. Her first novel, City of Silver was named one of the best debut mysteries of the year by Deadly Pleasures Mystery Magazine. Annamaria is a world traveler, and draws upon her experiences and shares her love of these countries in her writings. Follow the author on Facebook. A beautiful sunny Pennsylvania afternoon was the perfect setting for a book signing. Debbie Beamer of Mechanicsburg Mystery Books coordinates the book sale. The casual relaxed setting of the gardens offered the opportunity to purchase a book or two, chat with the author, sip some strawberry lemonade and nibble some crackers before venturing into the tea room for an African themed culinary adventure. In the far corner of our garden are two very old (75 years or more) plants. They were here on the property when it was purchased in 1968. The tall bush is a Vibernum, or "snow ball bush". The white flowers are perfectly round and do remind us of snow balls. They are a bit lighter then snow balls so if you are aiming for someone they need to be just a couple feet away but they don't hurt like snow balls. Next to that is this bush, Calycanthus floridus, a native plant that we are glad to have in our garden. At one time it was found in every yard so its nickname is simply "shrub". It has a sweet scent when in flower. Our mother told us when she was a schoolgirl she would put one of these in the corner of her handkerchief for its lovely fragrance. This very easy to maintain plant, flowers for only 2 weeks or so in the spring. Angelica and I journeyed to New Cumberland, PA to enjoy the tea cafe that is located in Oxford Hall. This Irish and UK Import gift shop specializes in Celtic jewelry, British and Irish foods, sweaters and other treasures. Tucked in one of the corners is their tea cafe. They serve an Afternoon Tea but reservations are suggested in advance for that option. We were just as happy to order off the menu. Angelica selected hot chocolate for her beverage of choice which came in a tall mug and was topped with whipped cream. Okay - even if it was a hot day, she was happy with that! I opted for a sampling of the Bewley's black tea, a nice hearty traditional Irish tea. It was perfect. The lunch option I chose was a Tomato and pesto Tart. It was topped with fresh spring greens and a drizzle of balsamic vinaigrette. It was so tasty, that if I had been at home, I might have licked the plate. Angelica selected their Chicken Salad sandwich which was loaded with grapes and walnuts. She was also pleased with her selection. Their counter includes an assortment of cookies, brownies, and scones, but we decided to head to our favorite ice cream destination and enjoy a waffle cone from Brewster's. We visited Oxford Hall several years ago, and according to our blog post then, we both ordered the same menu items during that visit too! Our definition of herbs is any plant that is "useful to man". This can be through seasoning foods, yummy teas, medicinal plants, plants to dye/color fabric, symbolic herbs, and fragrant herbs. This broad definition of what a herb is gives us wide license for what plants we can add to the herb garden. We love to add some colorful edible flowers or some different plants with Native American Lore or magical uses. This variety of plants creates a unique habitat in our back yard. We provide food, cover and water for birds, bunnies, chipmunks, and have even seen opossums and raccoons in the yard. We can welcome all sorts of pollinators in all stages of their life. This wall represents our commitment to the wildlife and critters we share our yard space with. The oval plaque in the middle is the 2015 Garden of Distinction from the Pennsylvania Horticultural Society (they do the Philadelphia Flower Show every year). This is the one I am most proud of as the garden was visited and judged. Not only is the garden a sanctuary for wildlife, it offers a tranquil respite for any one who needs quiet comfort offered by the silent beauty of the fragrant herbs in this peaceful place. Our gardens are open to the public, dawn to dusk. It is a welcoming sanctuary for all. In Celebration of a Queen! Not just anyone gets to celebrate two birthdays in the same year! The Queen's actual birthday is on April 21st, but the official celebration takes place in England in June when the weather is a bit more enjoyable. Festivities have been ongoing this weekend, complete with the royal appearance of Princess Charlotte and the youngest future king Prince George on the balcony at Buckingham Palace. Precious little waves from the sweetest royals cheered the gathered crowd. Celebrations took place at Sweet Remembrances last Sunday, June 5th at our Annual Queen's Tea. To honor the Queen, a champagne toast, Long Live the Queen! Long May She Reign! hearkened the beginning of the festivities. The first course of the Afternoon Tea began with a salad of assorted fresh summer berries topped with feta cheese and a poppyseed dressing. The sandwich selection included the 1953 Coronation Chicken Salad, White Cheddar Pimiento Cheese Florettes, Garden Party Rose Petal Sandwich, Herbed Party Sandwich on Rye, and a Puff Pastry Round with Turkey, Provolone, and Avocado. Scones featured Kensington Palace Scones and the London Claridge Hotel Scones with currants accompanied with sweet cream and raspberry preserves and an assortment of fresh fruit. The dessert medley included a White Chocolate Pistachio Truffle, Peanut Butter Rosette on Chocolate cake, and Almond Cream Strawberry Tart. 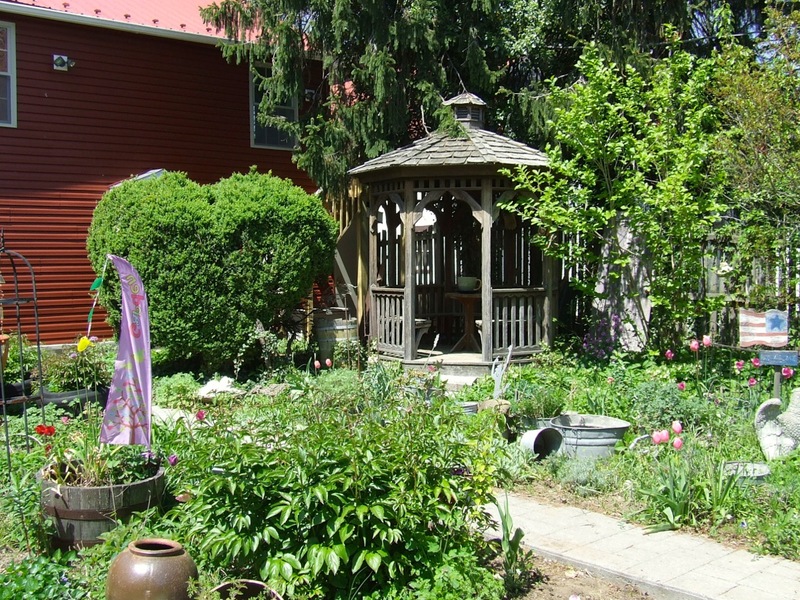 Just off the highway is a hidden secret, Cloverleaf Herb Farm run by Kathy and John Musser which features a cheerful one room herb shop and the cleanest greenhouses around! The fragrant shop has soaps and oils and sachets and bath salts and a few fairy goodies all displayed very attractively. Kathy sells potted plants inside and alongside of the greenhouse. Everything is well labeled, well organized and just lovely. During our recent Rosemary House Traveling Herb Seminar we spent some time here picking out a few new treasures to add to the garden. She has lovely little garden beds tucked through out the property. All are well labeled and manicured. Such a fun stop! A good last stop before heading back to Cumberland County after a day of adventure with our Traveling Herb Seminar companions! As part of our recent Traveling Herb Seminar of Lancaster County, PA we visited this lovely Federal Home and grounds. Wheatland is the home of the only president to come from Pennsylvania, James Buchanan. While he does not hold a place in history as a particularly effective president, his home is still intact and does provide us a great glimpse into the time period. James Buchanan never married. His sister died young and one of his nieces choose to live with her Uncle James. She came to live with him at age 10. This niece was quite poised and at age 26 she was the hostess of the White House during his term. This was Harriet Lane and she was the first person to be called "First Lady". She also guided her bachelor Uncle through decorating decisions and china ware options. Harriet Lane went on to help begin the Smithsonian American Art Museum, a home for invalid boys (now part of Johns Hopkins) and the St. Albins School for training choir boys. Wheatland is a Federal Style home with 17 rooms many of them with original Buchanan pieces in them. The second owners made very few changes and then bequeathed the property to the Jr Civic League of Lancaster who later gave it to the Lancaster History Organization. Sugarplums and Tea was our lunch stop for the traveling herb seminar. 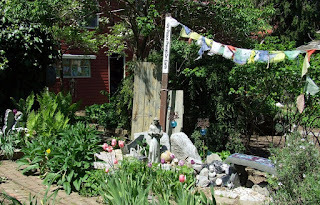 This tea room is located off the beaten path in a planned housing development. With the tea room on the first floor, the top part of this converted farmhouse is utilized as a community room for the area. This beautiful spring day allowed for seating inside and outside on the patio. Tea options included a wide selection of hot teas or iced teas. Once our tea orders were taken, Afternoon Tea service began with presentation of two scones, cream, curd and berry garnish. A variety of scones were served that included: Chai, Traditional, Poppyseed, and Cranberry. The tea tray featuring their famous Hawaiian Chicken salad, Cucumber Sandwiches, Pinwheels and Veggie Pizza was served next. A trio of sweet desserts completed our afternoon tea that included raspberry mousse in a white chocolate shell, a rich chocolate truffle and peanut butter bites. No one left hungry!